Over the years I’ve had a chance to stock many of the world’s best cello cases. These have taken various forms and been made out of different materials. As I tell most of my cello case customers, when you spend more money on a cello case you usually end up with a lighter case. No one likes a heavy cello case, but in that regard things are relative. 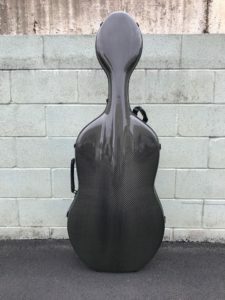 When I was a young cello student I had a black, vinyl-covered cases made from plywood. That thing weighed a TON! Even the entry level fiberglass hard cases typically weight 12-14 pounds. The lightest cases tend to weight 6-7 pounds. It’s easy to act like a 5-7 pound difference is insignificant, but try carrying it around a city all day or between buildings at a university. Those pounds can make a BIG difference. Enter the Musilia M6. At 7.7 pounds, it can’t lay claim to being the lightest case on the market. However, it does have an innovative suspension system and mounting points for an excellent backpack system. It has high-quality conventional latches. Unlike some full-carbon cases I’ve dealt with, it feels not only light but also strong. The “M” stands for Montagnana – this is what Musilia calls their “universal” case because it fits nearly all models of cello. Their “S” series cases fit Stradivari pattern cellos that are not quite as wide. 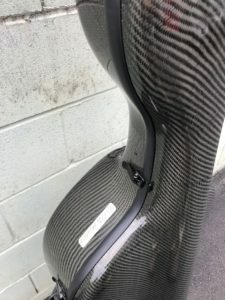 At right around $2,000, no one would call this cello case inexpensive. When you compare it to cases around the same price from different manufacturers, it really comes down to what your priorities are. If you want the strongest case, I’d argue that the BAM Hightech 1002XL is probably a better choice (and two pounds heavier). But, if you are looking for light weight and a great backpack system, the Musilia M6 is a great choice. I have one in stock – come check it out!